So, you love a band's music, yes? You can play their songs, too? But what if you also got to help write their tunes? It's happening already. Weezer frontman Rivers Cuomo has part-written a new song, Turnin' Up The Radio, and with the help of Weezer fans he's finishing it off. 'Songwrting 2.0'? Or just foolish? You decide. Here's Weezer and their fans' song. Weezer have also been jamming with their fans on their Hootenanny tour. Every fan who comes along is asked to bring an instrument. Great idea? Or just like bad school music lessons? 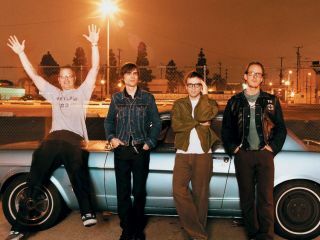 Looks like great fun, so kudos to Weezer. But who would you like to jam with?